Size: 750 sq.ft. - 1393 sq.ft. 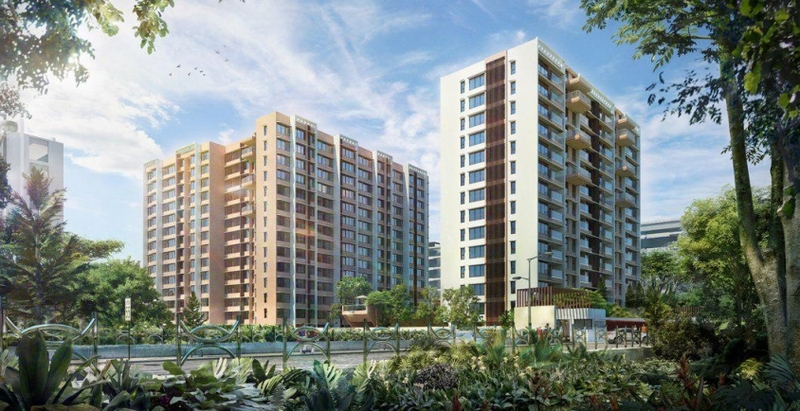 The Yashodhan Building by Kalpataru Groupis stationed in the well-developed location of Mumbai at Andheri West.Yashodhan is a project over 2 acresplot. Yashodhan complex is a set of 2 luxurious towers with absolute fineness.Kalpataru Yashodhan is masterly designed with multitude of amenities that rapidly transforming suburban stylingthat bring in fresh air and natural light to every rooms of it or the imported marble flooring that makes it glisten with opulence.This development will be completed by this year 2021 in April. The Yashodhan is a residential project located at Andheri West in Mumbai. The project outshines the skyline which consists of two towersand which arestretching over 12-13 storeys.It is one amongst the premium residential projects in Andheri location that offers its residents a choice in formats of 2 Bedrooms flats & 3 Bedrooms flats with sundecks. Kalpataru Yashodhan comprises of total of 195 Semi furnishedUnitswith wide entrance lobby. 2 BHK has a carpet area of 698sqft. 3 BHK has a carpet area of 751 sq.ft and 1441 sq.ft. Kalpataru Group has led the real estate market in Mumbai location with outstanding design & superior execution.Their goal is to be the most admired brand for its thoughtfully designed & innovative development ideas.Kalpataru goup focused on the development of Integrated Townships, lifestyle gated communities, premium Residential, Commercial, Retail& redevelopment projects. They come up with the project primarily in Mumbai(MMR) & Pune location. The Group also acknowledged for bringing up a long-term relationship with stakeholders. The developer undertaking projects in other major cities such as Chennai, Jaipur, Surat & Hyderabad. Location of Kalpataru Yashodhan is a major plus point for buyingand investing in property. It is one of the most prestigious addresses of Mumbai with many facilities and utilities nearby Andheri West. Andheri West is a popular suburb in Mumbai, Maharashtra. The area enjoys strong connectivity with the neighbouring areas through Swami Vivekanad Road. Andheri Railway Station is the nearest station from Yashodhan project location. Excellent civic amenities allowing smooth functioning of daily life of the residents. Some of the renowned schools and colleges,the famous ISKCON Temple, Hospitals also lie in the vicinity. Yashodhan Apartments are located opposite to Andheri Fire Station, S.V. Road, Andheri West, Mumbai, Maharashtra, India. This grand campus available with best-in-class features such as high speed elevators, club house with party lawn, senior citizen zone , multiple sports facilities, swimming pool with separate kids’ pool, rain water harvesting, sewerage treatment plant, sun deck, well-equipped gymnasium, health facilities, jogger’s track, kids’ play area, round-the-clock CCTV surveillance and video door security. Restaurants: -Baluchi, Mirchi& Mime, Govinda's Restaurant, Lucky Restaurant, Kebabs & Kurries, Shree ThakerBhojanalay. Schools: - Bombay Scottish School, Oberoi International School, R. N. Podar School, American School of Bombay, DhirubhaiAmbani International School, Ascend International School. Hospitals: -Induja Hospital, Surya Hospitals, Sujay Hospital, Holy Spirit Hospital, Global Hospitals, Nanavati Super Speciality Hospital. Bank/ATM(s): - Punjab National Bank Atm, Canara Bank, Kotak Mahindra Bank ATM, Canara Bank - Khar West, Union Bank of India ATM.